Over two weeks ago, telecom operator Vodafone launched its ₹1499 plan for prepaid customers with a validity of 365 days, i.e., one year. Well now, the telco has launched a new plan for its prepaid customers that’s priced at ₹1699. Like the ₹1499 plan, the ₹1699 plan for prepaid customers is also a long-term plan that comes with the validity of 365 days. In fact, the ₹1699 prepaid plan offers the same benefits that are offered by the ₹1499 plan. The ₹1699 plan offers 1 GB of 3G/4G data per day which translates to a total of 365 GB of data offered during the validity period. The plan also offers unlimited local and STD voice calls, free national roaming, as well as 100 free SMS per day. In addition to that, Vodafone prepaid customers are also offered a free subscription to Vodafone Play. By launching this ₹1699 plan, it looks like Vodafone is planning to phase out the ₹1499 plan that was launched earlier this month. At press time, the ₹1499 plan is only available in UP East. And the ₹1699 plan, on the other hand, is only available in Mumbai and Assam. However, we are expecting Vodafone to further expand the availability of this ₹1699 plan in other circles soon. If you are someone who lives outside of Mumbai or Assam and has the ₹1699 plan available in your circle, do let us know so that we can apprise our readers of the same. Vodafone’s ₹1699 prepaid plan competes directly with the ₹1699 prepaid plans of Airtel and Reliance Jio. 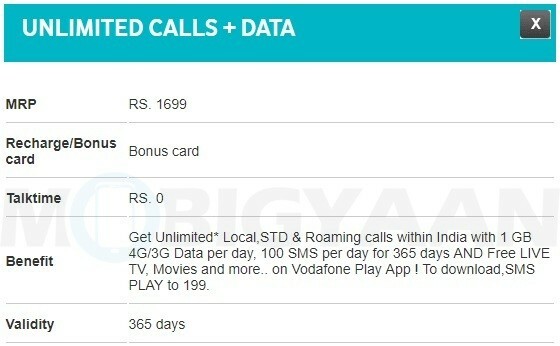 Airtel’s ₹1699 plan offers the same benefits as Vodafone’s ₹1699 plan. However, Jio’s plan offers more data than Airtel and Vodafone’s plans. While Airtel and Vodafone offer 1 GB data per day for 365 days, Jio offers 1.5 GB data per day for the same amount of time. Well, this translates to a total of 547.5 GB of data offered during the validity period which is 182.5 GB more than what Airtel and Vodafone customers get. 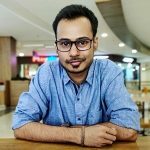 Not to forget that Jio customers can continue using the Internet at a reduced speed of 64 Kbps for the rest of the day after exhausting their 1.5 GB of high-speed data.